Charlie gets an unwanted glimpse into Sheila's plans. Steffy and Ridge are relieved that Eric is at home, but wonder what he will do about Quinn. Carter walks by and Ridge grabs him. He wants to know if he&apos;s carrying divorce papers for Eric. Carter tells him he cannot comment. Later, Ridge tells Steffy that he&apos;s not with Quinn nor does he want her. She doesn&apos;t believe he&apos;s really single. He tells her this has been a wake up call. Quinn tells Eric to think more about what he wants. She doesn&apos;t want a divorce. She tells Eric they were good for each other. She asks for one more chance. Wyatt and Katie talk about the direction of their relationship. Katie is unnerved by the fact that she was married to his father. He doesn&apos;t seem to mind. Charlotte bounces in with a latte for Wyatt. Apparently, it&apos;s an extra one, in his favorite flavor. 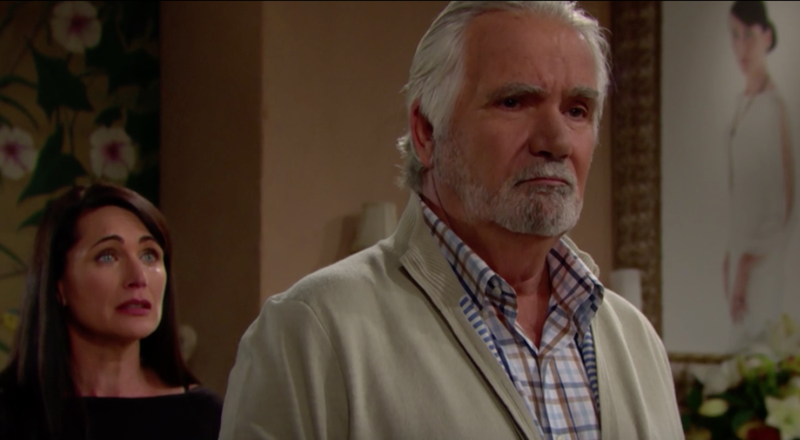 Charlie reminds Sheila that Eric is married to Quinn. Charlie wants assurance that she won&apos;t tell anyone about their connection. She tells Charlie she had it figured out and didn&apos;t need him to tell her. Charlie eventually realizes Sheila is having a picture sketched. She tells Charlie she will be Mrs. Eric Forrester again and he better believe it will happen. She warns him that everyone is in for a big surprise. Katie wants to meet at Il Giardino. When Wyatt arrives at the restaurant, he realizes that Katie set him up with Charlotte, who kisses him on the cheek. Katie tries to work through her distraction by working. Wyatt shows up and kisses her. Eric accuses Quinn of lying and not changing. She explains that the old Quinn wouldn&apos;t have cared about his feelings. In the middle of Quinn&apos;s tearful plea, Carter arrives. Eric tells her that if she&apos;s really changed, she will sign the divorce agreement. Eric&apos;s divorce agreement puts Quinn back to zero. No job, no money, and no use of the Forrester name, ever. He also plans on getting a restraining order. She asks if this is what he really, really wants. She signs the papers. Eric tells her to leave the house. As she walks toward the door, she hears paper ripping. She questions what Eric is doing. He tells Carter that he won&apos;t be filing any papers. After he leaves, Eric explains what Quinn&apos;s betrayal did to him. She promises not to lie again. They embrace.